The Penrhyn Male Choir is based in the old quarrying village of Bethesda in North West Wales. The village is situated in the Ogwen Valley in the Snowdonia National Park, some ten miles from the sea and the university city of Bangor. The Penrhyn slate quarry used to employ 3000 men providing roofing slate which was exported to most countries in the world. Automation has brought that number down to 300. The area is one of the strongholds of the Welsh language, the most widely spoken of the Celtic languages and one of the oldest European languages. Originally the Choir drew its members entirely from the local slate quarry after which the Choir is named. Nowadays, the hundred members are drawn from a large area of North Wales and from a variety of occupations. School teachers are in the majority at present, outnumbering the quarry workers by about four to one. There are professors and plumbers, accountants and ambulancemen, carpenters and computer consultants, television producers and barmen, firemen and farmers, bankers and businessmen – all with one thing in common – the love of good music. 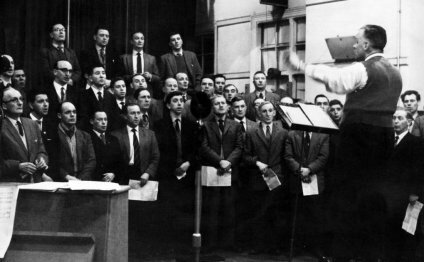 As one of Wales’ oldest choirs, Penrhyn’s repertoire reflects the traditional values of male voice singing. The choirs were very closely associated with the non-conformist chapels and rousing hymn tunes such as Gwahoddiad and Arwelfa are always firm favourites with audiences world wide. Neither would a Welsh male voice choir’s repertoire be complete without old favourites such as Men of Harlech, All Through the Night and Myfanwy. But new and equally challenging music stands alongside the old favourites. One of the UK’s leading contemporary composers lived just a few miles from the choir’s Bethesda base. William Mathias’ haunting melody To the Gypsies is a modern classic. Recent work commissioned by the Choir combines words by one of Wales’ most accomplished poets, Ieuan Wyn, with music by Welsh composer Gareth Glyn. In a lighter vein, there are adaptations of pop songs, Welsh and English, as well as the ever popular spirituals and opera choruses. During 1998, the choir performed in a unique event in the Fesival Hall, London, when they took part in “Côr Meibion”, a dance and music show choreographed by Sioned Huws.The show used song, harp music and dance to portray the landscape of Snowdonia. Only In Wales-Angels Male voice Choir on the Bus!